Climbing to the platform provides wonderful views of Strasbourg. Visitors can climb to the top platform of the Cathédrale Notre-Dame de Strasbourg and enjoy wonderful views of the city and the surrounding area. Be aware that we're talking about climbing up (and back down) 332 steps. There is no elevator, so be sure you're up for it before you start. Along the way there are many windows and places to stop and admire the view. 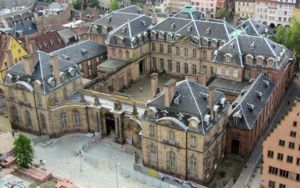 Be sure to do this, and take pictures as you want, because some things, such as a full view of the Palais Rohan, are only visible as you climb, and may be partly hidden when you're on top. It's wonderful to look down on the delicate flying buttresses from above and marvel at their grace and beauty. 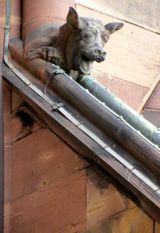 You'll also be able to see the details of some of the gargoyles and drain spouts. Above, On the top platform: "How high is this thing?" 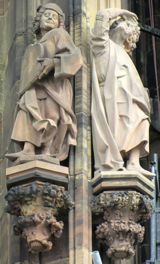 You'll get to admire the details of the tall spire and the sculptures up on the platform, where few people would see them. Looking at the cathedral as you climb gives you an even greater appreciation for the significant amount of detailed work that went into making it. The architecture of Strasbourg is lovely, with many sloping roofs. You'll get wonderful views of the rooftops from the platform. Depending on your timing, you may get to hear (and see) the bells chiming the hour. And on clear days, you can see to the Vosges Mountains and the Black Forest in the distance. 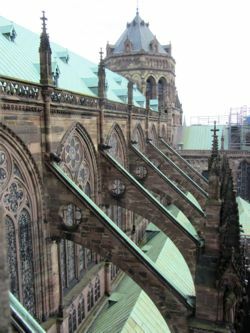 Above, Looking down on the flying buttresses, Strasbourg Cathedral. Below, Palais Rohan, seen while climbing up to the platform. 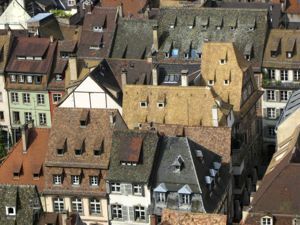 Above, Strasbourg rooftops, seen from the Cathedral platform.